Cuisine Kathleen: Three or More and Tasty Tuesday~ Got Dishes??? I am joining my friend Tam at The Gypsy's Corner for Three or more Tuesday. I have known Tam for years from the Holiday Forum at Garden Web. That was long before Blogging! Last week she posted some dishes from CTS...and tonight, so am I ! 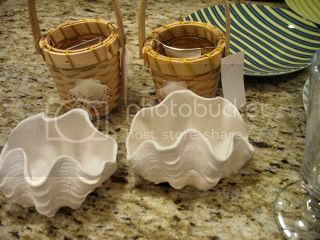 And these shell votives were 1.00 and the mini basket has a little glass inside..for a candle, or flowers..1.00..summer clearance..
And Cole at all the Small Stuff for Tuesday at the Table...stop over and check the other entries! 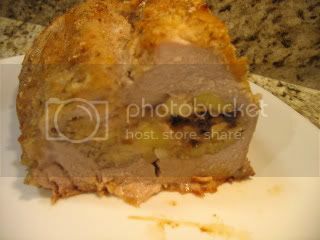 Pork loin, butterflied , seasoned and stuffed with sliced apples, raisins, onions, a bit of Panko mixed with Apricot Brandy....place in the butterflied and pounded thin pork. Roll it up, dip in egg wash and roll in Panko. Hasselback potatoes, carrots and snow peas, and fresh apple chutney..
And some brownies for dessert.. Boy you are back with a bang. When ever I make those potatoes they are a hit. I'll bet that roast smelled divine while cooking. 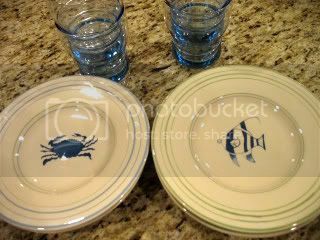 The striped and fishy plates are wonderful and so thus your meal sound!! 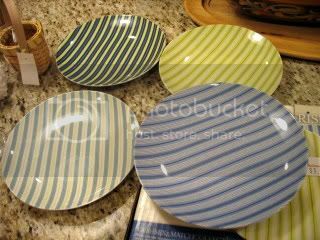 Kathleen, you found some great items at the CTS..love the striped plates, and I've seen those fishy plates and thought of you. If you ever visit Tam, stop and see me. You will pass right by! 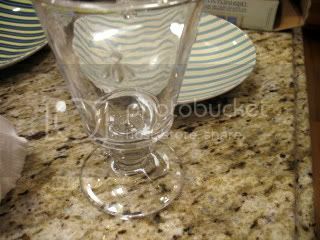 I saw those bee glasses in the Ballard's Design catalog, so great score!! Ya'll are lucky to have that store. Kathleen, great bargains ... useful, pretty, and good prices. I'm partial to the striped salad plate and can foresee lots of pretty salads in your future. .... 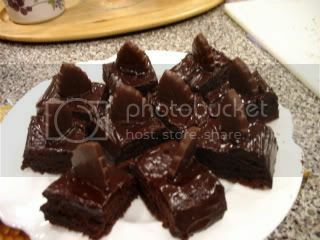 The brownies look very tasty. Another great haul, Kathleen! Can't wait to see the stripes on the table. Very pretty! This looks wonderful. Thanks for sharing it. I would love for you to join me at Diningwithdebbie.blogspot.com for Crock Pot Wednesday. It's easy, fun and economical! Come on over and check it out. I wish we had a Christmas Tree Shop here where I live. Great bargains for sure!!! And the food looks so yummy as well. Another great bargain shopping trip! Can't wait to see some of the tablescapes.. Wish I had received the bargain you were able to get on the Bee glasses..mine and the FDL ones I have were much more than $1.99 !! Oh my, you sure can find deals....and the meal, pork is one of my favorites! Fantastic finds! The meal looks yummy; thanks for sharing with TATT! Yummy!!! What time is dinner? 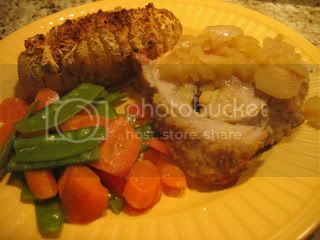 Your recipe looks wonderful, but Hasselback potatoes? I have never heard of that, I will have to "google" the recipe. I love the dishes that you got from CTS. I so wish we had one of them here in Winnipeg. How did I miss this post??? Maybe I'm catching up on the backlog due to your wonderful encounters with Dell? I'm so lucky that I got to go on that shopping trip, but I didn't get the dinner! That pork sounds amazing!!!!! !